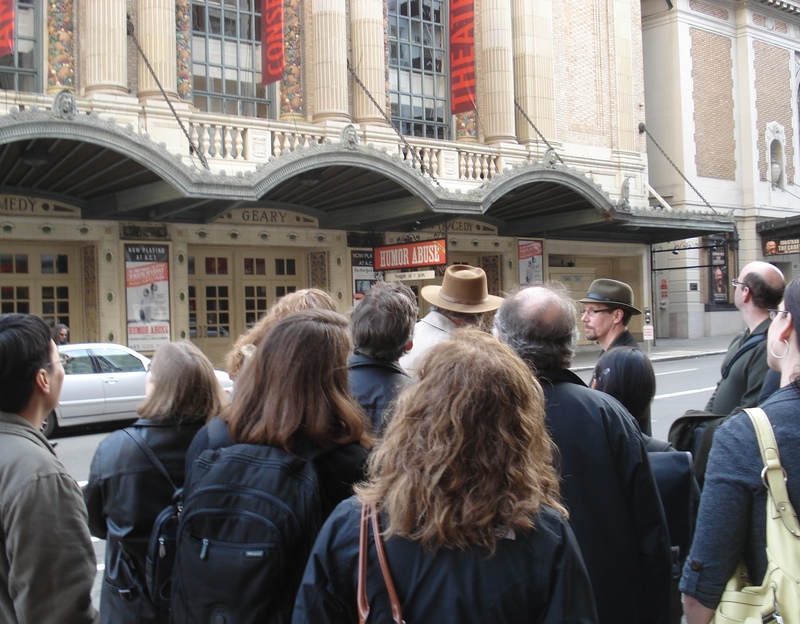 Shot above — I assemble the tour group for a gander at the Geary Theatre, where Joel Cairo had tix to see a play in The Maltese Falcon. With the brutal rains of winter pounding down, I’ve been doing only select groups by appointment on the side, but some people hauling into the burg — including, potentially, a guy from Italy — have requested a walk on Sunday February 28. Okay. What the hell. Anyone who wants to show up at noon with twenty bucks in hand to join in is welcome to wear the gum rubber soles down on the mean streets. I’ll be there, even if it’s raining like a monsoon. If it is lashing down like a monsoon, however — if it is an actual monsoon — you don’t then have to show up. There will be more tours later, especially as we hit May and the end of the rainy season. This entry was posted in Frisco, Tour and tagged Geary Theatre. Bookmark the permalink.